Because designing GPUs this big is "[redacted] hard"
Fermi/GF100/GTX400 has been a long time coming. For an industry where the major players are usually in lockstep with each other in some fashion, this latest cycle has been distinctly out of sync. 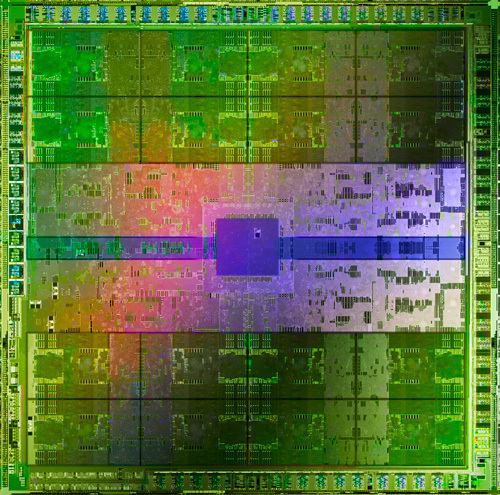 In September of 2009 we saw AMD launch their Radeon 5000 series, and spend the next 6 months as the performance leader for the discrete graphics market for virtually every price point. NVIDIA on the other hand missed the latest cycle by a mile, and when AMD was delivering 5000 series cards NVIDIA could only talk about the High Performance Computing applications of their next GPU, Fermi. It would be the next big thing, both figuratively and literally. In January we got the next piece of the Fermi story at CES, when NVIDIA was willing to talk about the gaming-oriented hardware and applications of the first Fermi GPU: GF100. 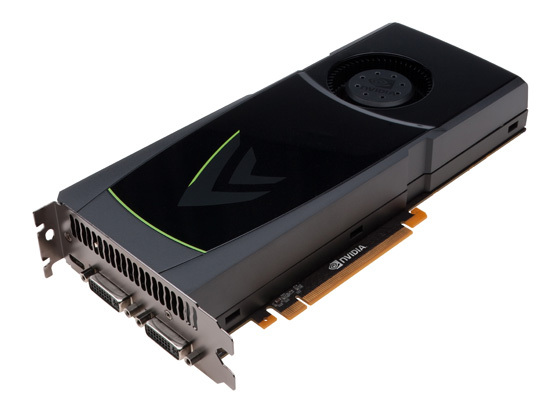 We found out it would be significantly different from the GT200 GPU powering NVIDIA’s GTX200 series, that NVIDIA was going to break up the traditional fixed-function pipeline and at the same time take a particularly keen interest in tessellation. What we didn’t find out is when it would ship. Much of this has been in NVIDIA’s hands – some of it has not. What’s indisputable is that TSMC, the chip foundry used by both AMD and NVIDIA, was not delivering the kind of yields on their 40nm process that AMD and NVIDIA were expecting. Both of them suffered for it. AMD could not get enough viable chips to meet demand for their 5000 series part, leaving a wake of disappointed gamers who could not get AMD’s latest wonder, and limiting AMD’s ability to profit from one of the few times in AMD/ATI’s history where the company had a clear lead over NVIDIA, and if you ask AMD also limiting their ability to control prices. NVIDIA meanwhile had to deal with the fact that they were trying to produce a very large chip on a low-yielding process, a combination for disaster given that size is the enemy of high yields. What’s also indisputable is that this 6 month wait has benefited few people. For the observers of an industry where the competition is cut-throat we saw GPU prices rise, when in the last generation AMD and NVIDIA knocked upwards of hundreds of dollars off of each other’s prices practically overnight. It may have been good times overall for AMD, but for buyers the competitive marketplace is sorely missed. That brings us to today. We can see the light at the end of the tunnel, the end of NVIDIA’s 6 month journey is near. We’ve told you about the compute applications of Fermi, we’ve told you about the gaming applications of Fermi, and now at long last we can tell you about the first products. It’s time to say hello to the GTX 400 series. Today NVIDIA is launching two cards: the GeForce GTX 480, and the GeForce GTX 470. Both of them are based on GF100, the first and largest member of the Fermi family. Right off the bat, we can tell you that neither card is a complete GF100 chip. We know from NVIDIA’s earlier announcements that a complete GF100 is a 512 SP/core part organized in a 4x16x32 fashion, but these first parts will not have all of GF100’s functional units activated. Instead we’ll be getting a 480 core part for the GTX 480, and a 448 core part for the GTX 470. Ultimately we will not be seeing the full power of GF100 right away, but you can be sure that somewhere down the line we’ll see a GTX 485 or GTX 490 with all of GF100’s functional units enabled. What we’re starting out with today at the high-end is the GTX 480, a card based on a GF100 with 1 of the 16 SMs disabled that will sell for $499, making it the primary competitor for the Radeon 5870. The disabled SM has no affect on the ROPs which are part of a separate functional block, but it does cut down on the shading, texturing, and tessellation capabilities of the card compared to where a full GF100 card would be. This gives the GTX 480 the full 48 ROPs and 768KB of L2 cache of GF100, along with 60 texture units, 15 PolyMorph engines, and 480 cores. Although the architectural overhaul means we can’t compare the GTX 480 to the GTX 285 quite as easily as we could the Radeon 5000 series to the Radeon 4000 series, the GTX 480 is still in some ways a doubled-up GTX 285 from a shader standpoint. 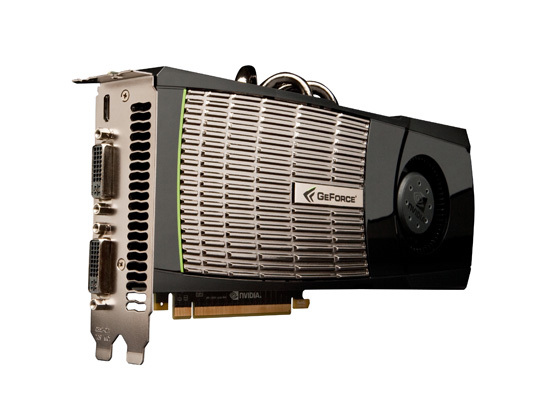 The GTX 470 on the other hand is a further cut-down GF100-based product that will sell for $349. As we stated earlier it has only 448 cores, a product of NVIDIA disabling 2 of the 16 SMs. Along with disabling the SMs, NVIDIA also disabled 1 of the 6 ROP clusters, which disables 6 ROPs, 128KB of L2 cache, and 2 of the 32bit memory channels. This leaves us with 448 cores running alongside 40 ROPs, 640KB of L2 cache, all on a 320bit GDDR5 memory bus. As is usually the case for a harvested part, GTX 470 takes a clockspeed hit compared to GTX 480. The core clock falls 13% to 607MHz, and the shader clock falls the same distance to 1215MHz. The memory clock on the other hand only drops by 10% to 837MHz (3348MHz effective). Overall this gives the GTX 470 around 80% of the shading, texturing, and tessellation capabilities of the GTX 480 and 72% of the ROP capability and memory bandwidth. One thing that caught our eye with all of this was that NVIDIA’s memory clocks are lower than we had been initially expecting. GDDR5 is readily available up to 5GHz while NVIDIA doesn’t go any higher than 3.7GHz; in fact between the smaller memory bus than the GTX 285 and the lower than expected memory clocks, the GTX 400 series doesn’t have all that much more bandwidth than the GTX 285 did. As it stands the GTX 480 only has 11% more memory bandwidth than the GTX 285, while the GTX 470 has 15% less than the GTX 285. Given the 384-bit bus, we initially assumed NVIDIA was running in to even greater memory bus issues than AMD ran in to for the 5000 series, but as it turns out that’s not the case. When we asked NVIDIA about working with GDDR5, they told us that their biggest limitation wasn’t the bus like AMD but rather deficiencies in their own I/O controller, which in turn caused them to miss their targeted memory speeds. Unlike AMD who has been using GDDR5 for nearly 2 years, NVIDIA is still relatively new at using GDDR5 (their first product was the GT 240 late last year), so we can’t say we’re completely surprised here. If nothing else, this gives NVIDIA ample room to grow in the future if they can get a 384-bit memory bus up to the same speeds as AMD has gotten their 256-bit bus. This leaves us with the other elephant in the room: yield on GF100. NVIDIA hasn’t commented specifically on the yields coming out of TSMC but we know even 6 months later that AMD still isn’t satisfied with things, so that should offer some guidance on the situation given NVIDIA’s larger die. As it stands NVIDIA chose to launch their highest end GF100 part with only 15 of 16 SMs in order to reach the “broadest availability”, which is a clear sign that NVIDIA isn’t getting enough full-yielding and high-clocking dies at this time to offer a proper unharvested part. The power/heat situation also bears mentioning, since it often goes hand-in-hand with yield issues. With a 500mm2+ die on the 40nm process, it should come as no surprise that both the GTX 480 and GTX 470 are hot cards. NVIDIA has to pay the piper for having such a large die, and this is one of the places where they do so. The TDP for the GTX 480 is 250W while it’s 215W for the GTX 470; meanwhile the cards idle at 47W and 33W respectively. NVIDIA’s large die strategy usually leads to them having power-hungry parts, but from a historical perspective the GTX 480 is the hungriest yet for a single-GPU card; even the GTX280 wasn’t quite as high. We’ll get in to this more when we take a look at measured power consumption.